Wow What a Freaking Fantastic Series so far!!!!!!! - Lori's Little House of Reviews. Wow What a Freaking Fantastic Series so far!!!!!!! I am not going to do a very big review on this one, just because I feel like I would have to go into big spoiler territory. I do have to say I freaking still love Dorian, and I love his parts of the storyline, especially towards the end, with his big scene with Aelin, and his father the king. I do also really like the scenes between Dorian, Aelin, and Chaol, towards the end also. So much happens in this book, that there are just to much to talk about, in my review of it. I liked that Aelin finally gets a best girlfriend again in Lysandra. I wasn't really sure if she was really good at first, but later when she does what she does to Arobynn, that monster, I was convinced. I love also what she chose to change into, what an awesome choice. Now back again to Aelin, I love her relationship with Rowan and how those to are growing much better for that relationship. The scene where they see one another again for the first time in awhile, was just so freaking adorable. And the scenes that she has with Manon were interested, and made me actually start to enjoy Manon. Manon scenes by herself still bores me the most, I do love when shes around Abraxos, her Dragon, I believe that is what they said he is. She tries to act like she has no heart but she does when it comes to Abraxos and also Dorian. I am so happy that I am finally starting to enjoy and fall in love with Chaol again, and that his relationships with Dorian and Aelin are starting to get repaired. I feel so bad in regards to what happens to him towards the end of the book, and what happens to his team. 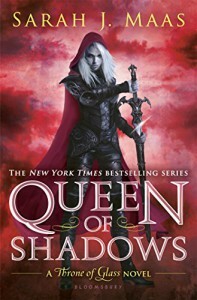 Aedion I really enjoyed in this book, and I love his relationship with Aelin which is cousin, I loved when Aelin comes to rescue him and what all takes place before, during, and after those two. I know I didn't even cover half of what takes place in the book, so if you haven't started this series yet, you need to get up right now and do just that. Its a kick awesome series. I have book 5 and the book that Sam is in, but I am taken a little break from this series, and I am going to read The Young Elites by Marie Lu, sorry if I spelled her name wrong. Hopefully I will be able to get into that series. I borrowed the first two books from my local library, so I will see what happens.